Every now and then, a distant star called KIC 8462852 dims by as much as 20%. That's huge. Even a passing planet as big as Jupiter would only block about 1% of the star's light. Ruling out a planet, scientists have no idea what could be eclipsing the star. The leading hypothesis is a family of really big comets, but that doesn't quite fit. 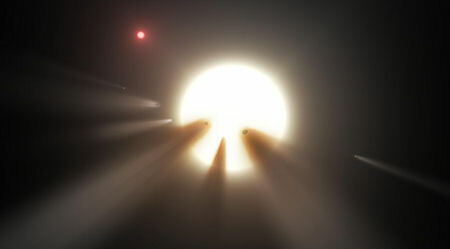 Te mystery deepened when astronomer Bradley Schaefer found evidence suggesting the star had also been dimming by about 16 percent each century.